Front 9 - scenic, fairly open, long and often windy. Back 9 - thick evergreen forest, with many blind holes and a deep ravine. New 9 - (hole A starts after hole 14) 3 holes in thick pines with low ceiling, 3 mostly open and 3 with woods on one side and OB road on the other. Multiple tees and pin positions. Long course plays 7,15,5. NE side of Columbus, I-270 exit Route 161 east (Dublin-Granville Rd). Go a mile, exit north onto Sunbury Rd., 1.3 miles to a right on Central College Rd. (Duchess Gas Station), 1st left (0.2 mile) into park. Turn right at stop sign, to parking lot at top of the hill. I wasn't impressed by this course. The front nine are in an open field (which I hate), and the back nine are in the woods with very little distances or elevation change. Very windy from the river. I'm from West Virginia, and none of the courses in Columbus area come close. This course really mixes it up. A few open, a few wooded and even a few in through tight trees. Watch for the wind of the lake. This was the course I learned to play on and is still in the mix for the best course I have ever played. There is a use for any style of shot, but you do need a big arm to be competitive. I am not a fan of the newer holes and would like to skip them once the rest of the course is back in place. I love the long tees and the signs are good. The only downside is it's own success as it can be busy but the people are nice and the vast majority are very polite so the faster groups play though. If you are ever in the area, this is a must play. what can i say it's the Hambrick this is truly a world class course(when all the holes are open for play). The long tees make it a long and challenging play even for those big arms out there and even from the short tees through the 27 holes it's got at least some of everything you could want in a golf course.I especially love the huge tee pads(most will seem small after this)and you will use every shot in your arsenal at some point.Can get crowded on the good weather days.Avoid going over the hill on the back 9 or it could be a long day but an absolute must play for every avid disc golfer. Loved this course while on vacation. Mix of open and wooded shots was good. Especially enjoyed playing through the pine trees, I don't get that in my home area of Freeport Il. The wife and I especially liked the basket placement on top of the cement steps. This was a fun 27 holes. A must play if you are in the area. Could use a direction sign between holes 9 & 10. 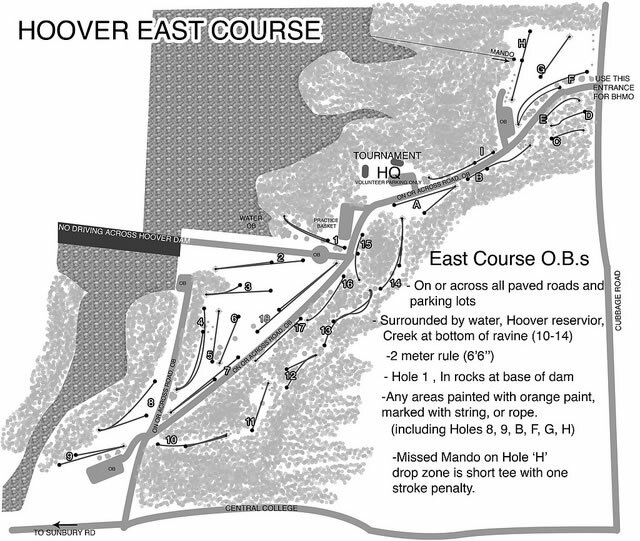 Each nine has a completely different feel, the front is open, grassy, and net downhill to below the dam, while the back plays almost entirely through clearings and tunnels in pine woods, back up to the parking lot. In late-summer and fall there can be a group on nearly every hole. The course does a great job testing all aspects of your game, as nearly every type of shot is required. There are several "signature" holes that use the terrain really well or have interesting pin positions, but both nines have a couple in the middle that almost duplicate another. Pants are recommended as all season poison ivy is a major hazard, especially on the back nine, and sometimes the grass on the front is allowed to grow tall. A third nine, newer and playing as a loop off of 14, is a fun distraction if you have extra time and arm but can easily be missed, is flat, and doesn't add as much as it could. What can I say about Hoover? It's the first course I ever learned to play on almost 15 years ago...and it has spoiled me ever since. This is a great course, and well designed! Only down side is over the years its become the 'default' place for people to go, so it can get rather crowded at times.